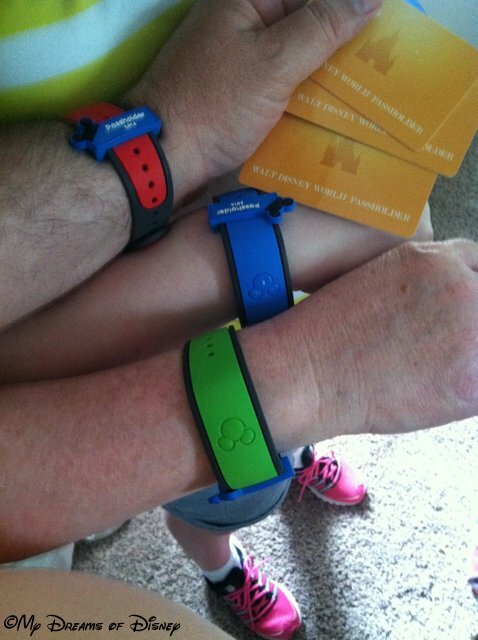 The Magic Band – the start of your FastPass+ Journey! Hello everyone, and welcome to #Day60 of our #DisneyWorldCountdown! With the changes to how you can schedule your FastPasses now, day 60 has much more importance than it did before! As a result, today we are taking a look at the FastPass+ system! If you are taking a Disney vacation, the new system that replaced the FastPass system is called FastPass+. This system allows you to schedule which FastPass attractions, shows, fireworks viewing locations, or even parade viewing locations you want to schedule ahead of time. If you are staying on Disney property, you will be able to schedule your FastPass+ reservations starting at 60 days out from your vacation start. It has also been reported that if you are staying at the Dolphin or the Swan hotel located at the Disney Boardwalk region that you can make your FastPass+ reservations at 60 days out also, although you won’t get a Magic Band unless you pay for one. If you are staying off property you will be able to schedule FastPass+ reservations, but only at 30 days out. The way things currently stand, you can reserve up to 3 FastPass+ reservations prior to arrival per day. All of them have to be made at one park. However, if you finish your 3 FastPass+ reservations, you can then go to the kiosks and make additional reservations. Also, if you have a smartphone or tablet device, you can make changes to your FastPass+ reservations on the fly by accessing the My Disney Experience app. Remember, Disney has rolled out Wifi throughout the parks to make it easier to access the app. Reviews are mixed from what I’ve seen about it. Some people don’t like it, and some people do. Generally speaking, though, the reports I’m seeing from people that have experienced it have been favorable. Most report few issues with the system, and quick response and resolution of problems when they did have a problem. For us, it will be really interesting to see how it works for all of us. Our reservation is a complex one — Cindy, Sophie and I have annual passes, Leigh Ann and Riley will have regular park tickets, and Sheila, Randy and Miss J will have Disney Premier Passports. All of this really makes for some interesting FastPass+ selections. I’ll be keeping track of how well it is working and will let you know in a followup post how it worked for us! In the meantime, tell me what you think about the FastPass+ system. Like it? Hate it? Wish it was like it used to be? Let me know in the comments please, and thanks for stopping by!